1. Arboe. 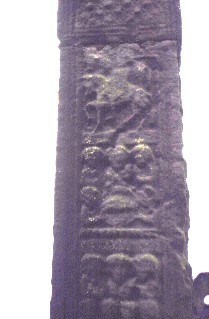 "Old Cross of Ardboe". Detail Cross Shaft. West Face. The Cross is carved from 4 blocks of red sandstone. It measures 5.7 m high, and 1.07 m at the arms. The shaft is 58cm wide and 36 cm thick. The base has two steps. Detail showing the upper panels of the west face of the cross, in particular W3 and W4.